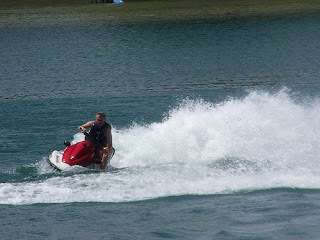 This picture may not look like I am flying but I think deep down in my brain I thought I was! Its kind of hard to not think about flying after being in the cockpit for 25 of my 30 years on active duty. I was blessed with many great opportunities to learn new aircraft, visit new places and fly with the best crews and personnel in the aviation business! They were great! I flew helicopters (UH-1N) first; went to fixed wing (T-38 instructor); back to helos (UH-1H and N; HH-3 and HH-60) and ended my career flying C-141s and C-17s. I have seen sunrises from 35,000 feet, sunsets over Hawaii, the mountains of Alaska, the dark of an Arctic winter night from 100 feet above a glacier with night vision goggles, the smile of a new pilot after soloing and then graduating with their wings, the TV footage of a rescue mission with lives saved and many other wonderful events! I knew it was almost to the end when the passports of my fellow crewmembers had birth dates well after my college graduation day and I spoke like a "dad" with them. They respected me for my experience and not so much for the "great hands" of a skilled pilot although I did occasionally surprise them with those too! We all have skills that we enjoy using and I was fortunate to have found a career that matched! I hope you are using your "best skills" in some endeavor that makes you feel good! I hope you feel that is worthwhile and improves your life, family and community! It sure is a satisfying way to enjoy life! Why are some words just so much scarier than others? Cancer certainly is. I remember when my surgeon called early one Saturday morning. I had seen him in his office just the day before, he performed a biopsy. A gazillion people have them done. We chatted, and he said he was leaving on a long awaited vacation that night. So when the phone rang Saturday, and I heard his voice, I honestly could not figure out why he was calling... and would not process what he was saying. He would not hang up the phone until I repeated his message to me as I stood by the phone swirling in a world of mixed words and zero comprehension. Malignant. No. Not me... bad things happen to other people! Right? Well, when handed lemons make the lemonade: good and strong. Or in my case have a spouse who is beyond good and more than strong! So, Dale's that sweet stuff that takes a lemon into lemonade, and therefore palatable! We have traveled down this cancer road for over 2 years now. We listen, we talk and we laugh. Life is good even when scary words hit ya and hurt! Do you know of someone who is recently facing an illness or stress that is beyond their strength? Know that your smiles, your wisdom, your touch and presence will mean the difference between depression and physically rising above that stressor. Be there. Playing in the dirt is proper for all ages. There is a parking lot of tonka trucks beside our garage: big, dirty, a bit rusty.... well used. Now, that is the way it should be. The bright yellow and brown are visible as soon as you near the house. We have a very well maintained lawn, sun gardens, and a mulched 'sitting area'. And we have grandsons. YES life is good! We also have a gravel driveway. I give the boys trowels and the freedom to move dirt. With determination they pile up pebbles and stones. They build roads and bulldozer fodder. It takes them hours to accomplish a good mess. And, may I add with pride, they do it well. These guys are not the only one who stoop and sweat with a trowel in hand. Dale and I hover over our seedlings in the garden right now. We move and remove rows of weedlets - not a word but should be: tiny little weeds waiting to grow larger than a watermelon. We travel up and down the rows of carrots and green beans with a bucket filling it with our weed pickings. Our objective: a continual table full of fresh harvest and a shelf full of canned vegetables. Do you see yourself in your children's play? You should. It will bring smiles and laughter to the mundane. Share with us some of your laughs. We would love to hear from you. One of the biggest challenges of military families is deciding when it is time to step out of the service and join the civilian world and job market. I have seen many fine military personnel and their families make that decision and most had great reasons when they did step out! Some examples included the the family that wanted their high schoolers to stay at one school; others had a great job opportunity sitting there waiting for them; most had seen enough moves and long separations; some were just tired of the military routine or had missed a promotion cycle/opportunity and with their disappointment had decided to move on as a civilian. After I retired I saw the opposite too! I had a friend at my civilian job who was a member of the National Guard and decided to go active duty due to the benefits he saw that I retained as a retired member. His spouse was also a Guard member and they made a team decision to go active which is how most military members decide when it is time to leave as well. The big draw for them was a steady retirement check which the corporation we were working for did not offer! Since military families play a huge role in the decision whether to make the military a career, it can be critical that they are well informed about this decision. With experience as a career military person and seeing the outside civilian work force I have to say there are many benefits to military service that the current economy does not bestow on our civilian friends and their family members. I saw loyalty from the services to their members offering training and opportunity which many or most civilian corporations do not offer. Be sure to look at all the options before you decide which course of action is best for you! Consider the different pay, bonuses and housing and other allowances you receive. How about the commissary benefit? On base child care? The chance to travel to or live in locations you would never have seen is frequently overlooked as well! Then balance that out with family needs, stability (possibly, as many corporations are here today and gone tomorrow), spouse employment, the cost of groceries and the commute which is getting very expensive compared to what many military folks see today (in on base or post housing for many). Consider risk factors such as physical and mental health as well which can be major concerns with combat stress and family fears involved. Of course, each is different and we make our own analysis but be sure to consider all the facts before jumping over the fence to greener pastures. Are you making the career decision now? What factors are important to you? Give us some that I haven't mentioned or ones that need to be expanded on or discussed! Help your neighbor and friends with a discussion of why and how you made your decision! I am scatter brained. I'm not sure if this a product of being a mom or just a matter of being who I am. I'll start doing one thing, remember something else I was supposed to finish and move on to that, leaving a trail of unfinished business behind me. Sometimes it is the kids that call me away, sometimes I just plain forget what I was doing! Today I was working on writing an article for our MilitaryAvenue.com Partners when I surfed onto Stars and Stripes (which really had nothing to do with my article, its that scatter-brained piece of me). They are publishing Father's Day messages in their overseas publication and on-line. The deadline to have it submitted for the print editions is June 2nd at 8AM. I think you can still submit one after June 2nd but it won't be published in print. Your favorite dads will still be able to read it online at messages.stripes.osd.mil/fathersday. New Discoveries and Your Military Benefits! Memorial Day weekend was wonderful! We had beautiful weather and great family get-togethers; and watched the Memorial Day parade in our small town with a niece proudly marching in the high school band! What fun. 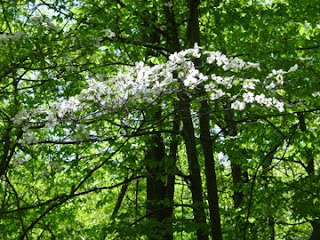 During a late walk on Memorial Day after all the festivities Deb and I discovered a couple of beautiful Dogwood Trees in our woods that we had not seen before. They were huge and we are still wondering how we missed them for the last 6 spring/summers!?? Maybe the cooler spring allowed more blossoms and/or the sun angle was right in the evening? But the blossoms jumped out of the new green vegetation and they were tall (30 feet plus) which may be another reason we had not seen them as we tend to be looking at the ground for new berries and poison ivy (to avoid of course) etc. at this time of the year. Isn't that the way it is with many new discoveries? Often it is something simple and we wonder how we missed that; didn't try that before; see it or enjoy it! One of the discoveries we often jump over and then go, "that was easy" or "why didn't I do that before? ", is our military benefits! We have experienced or shared the challenges of the GI Bill, the VA Disability System and Loan System, the Tricare Medical Programs, the installation medical community and remote and mail in pharmacies and many more programs. There are some pretty bad stories/incidents that some have experienced but most experiences are great with comments like: "that worked out nicely", "what a kind person helped me" and "wasn't that great". Sometimes we need to be persistent with the providers who work for the many systems that provide our support structure but a kind word and smile (yes, I think we can smile over the phone too) frequently works wonders. I remember working through issues and laughing with a person on the phone from 2,000 miles away over her plans to go use MWR facilities and taking her grandsons fishing while I was looking outside at below freezing temperatures and trying to figure out how to apply for Combat-Related Special Compensation (CRSC). If you have not heard of this great program for those injured or disabled please contact service personnel officials about it. It was a "discovery" that was not too difficult and resulted in a benefit beyond the VA Disability Program which I had not expected. Another system that I learned to use that is relatively simple to use is the Tricare Mail Order Pharmacy (TMOP) through Express Scripts. It makes our lives a bit easier with no nearby military pharmacy and the cost is lower for meds when ordering them for long periods of time. We also recently discovered the value of medical benefits when serious illnesses struck and we saw the size of the medical bills which were covered by Tricare. Although we had co pays and individual deductibles we reached the family and individual caps pretty quickly which saved us tens of thousands! The providers are often trying to "sell" you their program but if someone is not a very good salesperson there are ways to provide feedback to them as well. If you do run into a road block (very unlikely) be sure to use the system to let them know they are being paid to assist you. Which military benefits have you "discovered" to be the most "customer friendly"? Give us an installation or service that you want to tell us and others about! Just think if we tell everyone about the best "sales person" or "benefit" others can be enjoying them as well! It is Memorial Day! I got up at the "crack of dawn"... (ok, it was 7:30am but I am a night owl) so that I could get breakfast going, get the troops dressed, and head down to the local Memorial Day parade which started at 9am. The boys brought their bags to grab the candy. I brought my camera to grab the photos. It hasn't been a very well attended parade in the past (or today for that matter) but those of us that are there are excited to be there. The boys enjoy the upfront view of the high school marching band, the larger then life fire-trucks and the miniature ponies. My favorite part though is the beginning. The police motorcycle is leading the way and right behind them is the American Flag proudly being carried by local veterans. As the members of various branches of service walked by all of the folks around us started clapping. Just ordinary citizens, proud of our troops. My heart swelled with pride. Maybe my husband will march with them next year. We have a busy Memorial Day planned. At noon I will go with my mother-in-law to attend mass. Our neighbor gave my husband's name to the local church and they are going to say a special prayer for him today. Although I am not Catholic, it seems appropriate to be there. My mother-in-law is Catholic so she'll help me follow along in the service. We also have yard work to do and a picnic to attend. Although not directly related to the reason behind Memorial Day I see them as quite fitting. The freedoms we have to do as we please are given to us by those that have gone before us. Those that have fought for our freedom. Many have lost their lives and to that I am entirely grateful. To my grandfathers, my dad and my husband and all of the veterans past and present thank you for giving us the freedom that I cherish! The freedom to attend the church that I wish; the freedom to spend my time the way I want; the freedom to enjoy life one day at a time. A happy Memorial Day to you all! Daniel, the oldest son of the Kissinger family, packed his belongings; made friends; and learned the ins and outs of world travel. Dan recognizes the need for communication and the flow of information that is readily available via internet. With his sister Leanne, another class act brat, created an avenue of information that is a super highway and an integral part of thousands of military family PCS's (moves). I think that number is too small... Now Daniel has established his own family in Grand Rapids, MI. He travels to meet and speak with military personnel. With friends stationed all over the world topics of conversation often boggle the mind of his home grown wife! Change is good, challenge is better when met with a great team - and Daniel has built that on all fronts. Daniel was part of the team that held a PTAC conference in 2005 with Michigan business educating them on the military installations, jargon and the Department of Defense contracting. Always on the move, always thinking steps, leaps and miles ahead of his peers: Dan is a Brat in the News. Do you need information on your next PCS? Want to have access to some great moving tools? Interested in the schools in your area, or at the installation that is ahead of you? Cruise the information on MilitaryAvenue.com. Each military service is represtented. Over 240 Installations are laid out with busineeses, articles and events. Do you see a business that should be on the site? Let them know to contact us. We are growing and updating information continually - that is what is done on the highway! Tomorrow is my 5-year older's last day of preschool. This Fall he will board the big school-bus each morning bound for kindergarten and travel down the next road in his education's journey. He has been in preschool for three years. He has a September birthday and we live in a public-school district with an August 1st cutoff. 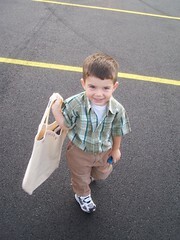 So when he started three-year old preschool in the fall of 2005 he was one of the youngest in the class. He was barely potty-trained and he clung to my like glue as I said good-bye the first few weeks. I was afraid he would never adjust and he would be attached to my hip until he was 18. Now, three years later, I drop him off and he barely looks back to say 'good-bye'. As I call him back to give him a kiss on the cheek he rolls his eyes as if to say, "MOM, PLEASE, not in front of my friends!" He's happy to see me at the end of the morning and tell me about his adventures. He talks about his school-friends all day long. Oh and his teacher, she's better then sliced bread in his world! I'm not ready to give up my preschooler! Who gave him permission to grow older? Who gave the preschool teachers permission to help him make this right of passage? How can a mother be so thrilled to see him thrive, yet at the same time lament the fact that he is growing up? Thanks goodness he has a younger brother! Wow, I am going to be a mess when the "baby of the family" decides to grow up :). Sometimes a picture says it all! Have a great Memorial Day weekend and remember those who have served us all so well! We will be publishing our May Newsletter this Sunday, May 25th. The theme is "Military Appreciation", encompassing both Military Spouse Appreciation Day and upcoming Memorial Day. I have some great articles lined up from our resident MilitaryAvenue.com bloggers, Col K & Deborah. We also have listed our top 10 MilitaryAvenue.com articles from this past month and our personal favorite blogs from April. Here is just a sampling of a great article from last year's May newsletter: Memorial Day (It is not just a day off). Sign up! We'd love to be in touch. Are You a Service Ambassador? I still have very strong memories of a day in July many years ago as I started down the road to Grissom Air Force Base in Indiana enroute to my first military flight physical. I had not enlisted yet as I needed to pass the flight physical to enter pilot training which is what the recruiter had worked for me. I remember the absolute loneliness I felt on the highway that day and fears of what I was getting into and where was I going? I had no one with a similar experience to talk to about my decision to join the Air Force. There were many unhappy veterans (it was the Vietnam era)and one friend from my church and high school had recently been killed in a helicopter crash in Vietnam. My family had just experienced the loss of our mother due to breast cancer and here I was the oldest heading off to new frontiers. I survived the physical that day! Although they had dilated my eyes and I had no sun glasses since I had not known what that was going to be like. The painful, squinting drive home only took a couple of hours but I had been impressed by how I had been treated and they had told me I passed so I had become more convinced that I was going in the right direction. Fast forward through a wedding and pilot training and setting up that first home! What a great experience. Then we returned back to my hometown for the family get-togethers, Sunday School picnic and a million questions about our lives. What was it like? Did I enjoy flying? Were we going to re-enlist? How was all the free food in the commissary (we still laugh about that one)?, Where was our next assignment? What had I done wrong to end up in Nevada? etc, etc,? We had such fun telling everyone the great stories but then added a few moments of laughs and challenges as well! We felt somewhat like ambassadors for the Air Force in our civilian community. We told them about all the new friends we made and how we shared experiences with them. We didn't know about a career yet but knew that we would make the right decision at the right time for our careers and family. Later we talked about overseas tours, youth groups led, vacations in unusual places and many other exciting events. We would also tell them we missed them! Come for a visit! We look back on those days with fond memories but then jump to NOW and discussions in our church and community about military service. We live a long distance from any installation so many of our friends have little contact with military personnel. There are still some misconceptions from those who don't know and we are the ones who can provide answers to their questions with our standing in the community. Are you a doer versus a watcher? Do you join into the activities around you and find a way to smile? Do you realize people are watching you? Do you recognize that some person probably is basing their perception of what military service is like by what you stand for and your lifestyle? 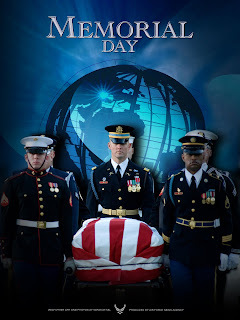 As we approach Memorial Day with our sense of patriotism and recognition for those who served and paid the ultimate price for protecting our nation, remember we are ambassadors and speak loudly with our actions and comments about our uniformed services and all that they stand for in this time of war! Do you know someone who is a great "ambassador" for the military services? Tell us why you think they are great! As the summer Permanent Change of Station season kicks into high gear I would like to talk about education! Why education now? Well, the new location and new job associated with the location give us an opportunity to review our goals and where we are going with our careers and families. 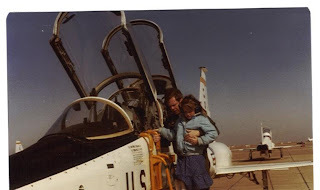 When I had one PCS from a Texas base where I had been training student pilots in the T-38 to a staff job at Scott AFB in Illinois, I had a very smart new supervisor. He sat me down and said okay you have worked hard and the flying was fun but now you need to think about your career and your family. You need to go back to school now and get some additional education and finish that professional military education as well. I can hear the announcements of "no time", "we are at war", "I might be deployed" and many other very valid reasons why now is not a good time to pursue educational goals. Great reasons but why push back education which will lead to success in other areas of your life as well? Is there ever a good time while pursuing our careers and supporting our families to target education as a priority? I don't think there is ever a convenient time. If you think the next assignment will be easier, the kids will be older and less work, my spouse won't be working so hard, etc you may be on another planet. One of your benefits of serving this great country is the education benefits to which you are entitled (ie earned, worked very hard for,etc). Take advantage of them! There has been some recent changes to the GI Bill and some add on benefits from the Services as well. You can find more information at your Base Education Office and most universities on or near an installation can walk you through the paperwork in short order (they are frequently the experts because they want you in their classroom). Many of these schools have an online capability! So if you do get deployed and have some time to go online you can continue. Don't forget those PME courses which are often required by the Services for that next promotion as well! Fill that requirement and the pay check goes up and you get new opportunity as well! One resource you should check out is the education category on MilitaryAvenue.com and our Reading Room with up to date articles on the GI Bill and other veteran and family programs! Let us know if there is something you are interested in us talking about as you settle into that new job and location! PS: I took my supervisors words to heart for my education but the words and actions of my spouse to encourage me to push ahead were priceless! So if you are reading this as the spouse of a military member be sure to let them know that their educational pursuits will be a team effort and its important for the whole family! Adventures Don't Stop Just Because of Scary Sign Posts! Park Rangers have to have a great sense of humor... they work all day in the great out of doors. They meet people from all corners of the globe. (If in fact the globe has corners...) They see the beauty of the changes in seasons: flora and fauna. They have access to the whole park, whereas the rest of us stick to the beaten path. The rest of us also tend to wander a bit to the left and right off that well marked trail. So, I can imagine at the local ranger meeting discussions that might occur. * Bear sightings... yes, they know how to handle that. * Heavy rain, and washouts... time for repair work. * Pesky insects... get a grip and handle it. * Trees down on path... whip out the chain saws and clear them out. * Foot prints off path, plants plucked off trail, garbage left under trees not on walkway. UGH. Then some smart fellow decided to make some signs, post them and watch the folks stroll on by. Believe me, it worked for me! No way was I even going to walk on the side of the walkway... I was one foot in front of the other foot speeding straight down the path's middle, eyes looking down. I might have missed bald eagles, snowy owls, or the space shuttle. My brain was fixed on NOT disturbing any of those slithering creatures. Congrats Rangers! You won! And I am sincerely sorry for looking at the plant life, and stepping where I shouldn't have. I get your message. I love your parks! We caught this sign in Great Falls, Montana, by the world's smallest river. Have you seen any touches of humor on signs in your travels? There is so much beauty in our great country. What is a recent park you have visited? We would love a description and rating. Post a comment, or send us an email! Today at lunch my boys asked for one of their favorite foods ... Grilled Cheese Sandwiches! MMMMM.... one of my favorites too! It ranks up there as one of my favorite 'comfort foods'! But really what isn't good with cheese on it?!?! Just to mix up the 'standard fare' today though I cut the sandwiches a little bit different. A few years ago, I had bought some heart shaped pancake 'shapers'. (Ok, I don't know officially what they are called.) You pour the batter into them on the grill & they supposedly make the perfect heart-shaped pancake. I must have been feeling ambitious when I did buy them because really they have just been official 'dust collectors' or 'drawer-space consumers'. Until today!... I used one to basically cut off the crusts and really just a touch of the sandwich part. They were the perfect size. The boys loved their 'special' sandwiches and it did feel better shakin' things up just a bit! 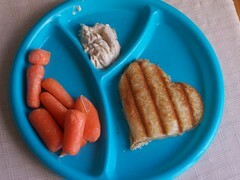 As you prepare lunch (or dinner or breakfast) this week for the kids think of a way to add your own special touch. It sure feels good! I had grandiose plans this morning of actually sleeping in. Saturday mornings were Hubby's. He would get up with the boys while I slept in. When I would finally get up the boys would be fed, the coffee would be brewing, life was good! So I thought I should start my own new tradition. Last night I set up the boys TV trays, put a bowl and a spoon on each and set the cereal on the kitchen table. I poured two cups of milk and set them in the frig. I set the TV to Disney and put the remote on one of the trays. I just knew this was going to work. The boys could get up. Turn on the TV. Eat some breakfast and I would still be in the comfort of my own bed. The coffee might not be brewing when I get up but you can't win them all. Oh how I love a good book. I am especially into the non-fiction type, self-help or motivational type. Right now I am reading "Chicken Soup for the Military Wife's Soul ". A dear friend, and fellow military-spouse bought it for me just before my hubby left. She inscribed some heart-felt words on the inside and now I will treasure it forever. The book has made me cry, laugh, step-back in time and look forward to the future all within just a few short pages. I pick it up when-ever I just need a short breather. When we are 'preparing' for something: a move, a wedding, a baby we can of course find a fathom of information on the web. Isn't it sometimes just nice though to put down the computer and curl up with a good book?! I scoured the web this week for just a sampling of some of the good informational and motivational books out there. I am determined to find more, create more lists but for now I will give you what I have found. Do you have any book recommendations? Please! let me know. Either leave a comment or send a note to leanne@militaryavenue.com. I love having other folks input! One of the best military benefits we discovered after joining the Air Force way back when was the commissary! The food costs were truly a savings and became even more of a benefit as our family grew in numbers. We truly miss having one close by in our current location. You should see the looks on the faces of the commissary staff at Selfridge Air National Guard Base when we pull our four (4) heaping to the top carts (that is the amount we can get into one 1999 Cherokee) to the checkout counter during our quarterly visit. With the current energy prices going up, the larger impact on some is the resultant increase in food prices. We are starting to see large increases at local stores in some items and one method to reduce those costs is to have a garden. It can be as small as a "deck tomato plant in a bucket" to a large vegetable garden with multiple varieties of plants. We have a fairly decent garden that we have planted each year after settling down in Michigan. During active duty we had small garden plots while stationed at Reese AFB Texas, Scott AFB, Illinois and Hurlburt, Florida. The one in Texas was in our "alley" behind our yard, the one in Illinois was in the corner of our backyard and Florida was behind our fence (out of the way of the kids giganto swing!). We enjoyed each one and while sometimes not very successful we enjoy our garden workouts and seeing the products of our labors. Why not put in a small garden and see the benefits? That tomato plant or two on the deck will produce enough fruit to help reduce the cost of a salad. If you freeze some they can contribute to a great spaghetti sauce in the winter time when the tomato prices go way up! Besides we all need the exercise from the bending, hoeing, and other activities in a garden. 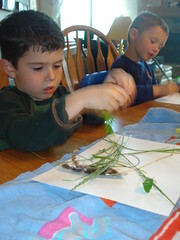 In addition, the kids get to see the fun of gardening and you can teach them a financial lesson too! Have a great summer and happy gardening! I grew up in a family of boys--my only sister started with 4 brothers and added 3 more after a family blending! We now have five grandsons and they are active guys just like my siblings during my much younger years and will challenge their parents and guardian angels much like we did! We lived in the country with lots of work to do but always found the time to do some fun things. We built a tree fort in a 300 year old oak with huge branches and a first step that could maim you if you missed the ladder. We had "bb gun fights" with no shooting above the waist--must have thought everyone was a pretty darn good shot! We tore an old Triumph car apart and left a chassis to drive through the fields and woods with total abandon. We found a tree that had fallen into a Y of another tree and created a perfect teeter totter that when raised was at least 30 feet off the ground. One brother still clearly remembers when we held one end down until he climbed out and then let go! His bounce on the way up left him hanging 30 feet above the ground via his hands only and not very happy. Too many "events" to list them all but my boys combined those genetic traits with being a milbrat as well! We always laughed at the crazy events but held our breath when we first heard about them or in some cases saw them in action. I remember when our guys discovered the network of tunnels under the base ops building at NAS Keflavik. They "adventured" into the labyrinth with friends and told us after the fact; thank goodness. They did laugh because when looking for an exit they used a "pothole" cover that came up right in the center of the security force's offices. Hahaha, they decided there was a better exit than that one. They also did sledding on "Dead Man's Hill" with a rather steep grade; played soccer in Florida and found a rather large rattlesnake that they thought should be "scared" away! I think I know who got scared in that encounter. They played out on the dunes near Albuquerque and decided the best way to get a stuck vehicle off the edge of a large ravine was to drive it down; I understand it was quite a ride but not one they would have wanted me to witness. The grandsons are starting to reflect similar traits as well. During one nice day last week two of the grandsons were playing by an Uncle's pool (which was still too cold to swim in--I will tell you later how I know that). They were playing follow the leader and going around a set of chairs that had been set close to the edge of the pool. Grandpa was encouraging the play and laughing and said "watch I will have to jump in with my wallet and cell phone to get them out". About 30 seconds later one fell in with a big splash and their mom yelled in a bit of a panic, "Dad" and off I went into the pool. Yep, the wallet and cell phone were still in the pocket. "C" was a bit traumatized but after cleaning up had a great day! As you see boys at play around military installations during this summer season take the time to enjoy them and even participate! Their games can keep you young acting and bring lots of smiles to your lives! With so many dads deployed the young guys need attention and to have fun interacting with other males at times too. Participate in chapel or youth programs as a teacher, youth coach, referee! Your life will be better for it and our next generation too! Military spouses have learned so much since the crud of the Viet Nam war. We have united, we share emotions, we gather for information, we speak up, and we even accept help when it is given. The baby boomers who served in the 60's and 70's with whom I have talked, do NOT have good memories of their service time. Most felt it was a 'sentence' that they wanted over ASAP, and then some! The Viet Nam War era spouses had no contact with other spouses: support groups just did not exist. Ahhh we have come a long way. We encourage, pass on information, check on others and have open dialogue with our unit's spouse organization. There really is organization in the military! When and where is one of these gatherings taking place? Fort Hood June 17 and 18, 2008. Read the blog posted May 6, 2008 for the great details. I mention the history of spouses to emphasize the importance of this get together. I was at the last AWTR Field Excercise. It was PHENOMENAL. Tara and Star run a great program - full of information, sharing and door prizes! What could be better? A wonderful dinner and great gift bag! Round tables were set for 8 new friends to sit and eat together. Shy ladies entered the room with one huge heart beating, weight on their shoulders and this in common: their hubbies were deployed to a war zone. In danger. Far away. Out of touch. Yeppers, there were tears shed and shared... but there was laughter and stories that hit everyone's hearts. Advice was given, taken, exchanged and stored. Gifts were given, appreciation from the military community was brought forward. Everyone left with their arms full, hearts a bit lighter and definitely with a feeling that they had someone with whom they could talk. That was the biggest gift of the evening in my mind. Take advantage of everything out there. Life is so good and sharing life's experiences just makes it that much better! Well it is clearly a Monday here in the great Midwest. It is rainy, cold and my head is throbbing. But I look forward to this week. We are going to get back into a routine. I enjoyed a week at my parents' house, "over the river and through the woods" as we like to call it. I get quite pampered by my mom there and it was nice to share some of the boys' bedtime reading responsibilities with my dad. In fact, I was dreading leaving. We headed home though yesterday after lunch and as we pulled into our driveway I took in a big breath of familiarity. The boys had pulled out their scooters within one-minute of jumping out of the car and were racing back and forth on our sidewalk. The answering machine was checked, the car unloaded (and piled in the kitchen) and I had a load of laundry going within 30 minutes. Yes, it felt good to be home! So this morning the 5 year-old is back at preschool. The 3 year-old is enjoying some morning PBS and the washing machine is STILL running ;). The lawn needs some major mowing (only if this rain lets up though); I need to find the kitchen table, lost under a sea of travel paraphernalia; and the pile of mail is a mile high. Tonight we have a school concert for the 14 year-old, as well as confirmation class. Despite the busyness that 'Home' means it also means that I am back in my own surroundings surrounded by the walls of routine. Ahhh... sweet sigh of relief. PS: A neighbor called yesterday afternoon (one of my many answering machine messages) to say she was making dinner for us tonight. She had planned on a crock-pot meal for her family and was going to make enough for us too. What a wonderful way for her to say "We care." Is there someone in your neighborhood that could use an extra dose of friendship? Making a meal is a tangible way for you to share your friendship! I stepped out early this morning to take in a breath of fresh air with my coffee! It was a brisk 35 degrees at 0630 and I was glad I could return to the house after taking in the early morning sunrise. I had a flashback moment though looking down on the flower bed when I saw "my mom's trilliums"! Trilliums are a wild flower with white flowers and long stems (an important factor for later discussion) and they always come up in the Midwest woods just before Mother's Day which is another critical piece of this story. Before military life and its many relocations worldwide the arrival of the trillium in my parents' woods was fair warning that Mother's Day was on the horizon! Our woods was loaded with thousands of them! My siblings and I would gather handfuls of these beautiful flowers for HER special day! We didn't have malls or money to do much shopping but we loved that smile on her face with the trillium in her hand and later in a vase. We lost our mom at a very early age to breast cancer and so the trillium I saw this morning reminded once again that Mother's Day is Sunday and how much she loved the flowers from her young children. Have a great Mother's Day and if you can't touch her give her a call or pull up a fun memory of mom! Information Note: As an adult I learned that Trillium are protected in some states as picking the flower can damage the plant. Today is the Friday before Mother's Day which makes it Military Spouse Appreciation Day. It is not something you will find on a Hallmark card or a special display of gifts to buy at your local box-store, but it still leaves me feeling proud of the women that came before me and the women (and men) that will follow in my own footsteps. "Military Wives - The Toughest Job in the Military"
I have to start off this blog with a funny story (well some may not see it that way but hey we all have a different funny bone). While living in the Puget Sound area we had the privilege of hosting an international visit from a Scandinavian country's military leadership at McChord Air Force Base. The visitors included the spouse of their equivalent to our Chairman of the Joint Chiefs and my military spouse (who had a full time job and had to take time off) acted as her hostess. They watched the Air Force falcon birds perform on the flightline, visited the child care centers and other interest areas during the day. During one of their conversations the General's spouse stated that she received a stipend for being a military spouse when required to attend events. She was being paid to travel and at home during "official events" she also received a salary! Later during dinner at the Space Needle my lovely bride turned to me and said how much did I think she should be paid for her "duties as a military spouse"? Being a quick thinking pilot I said something to the effect "that the Treasury couldn't afford what you should be paid dear"! And we couldn't! We do celebrate the military spouses' role tomorrow since Friday is Military Spouse Appreciation Day and is a great time to recognize our military spouses! How much is a military spouse worth? Their role and support are PRICELESS! Our country could truly not afford what our military spouses do for so little compensation (none) and recognition (some). Their true value is what they do for us and their spouses and families that allow our freedoms to continue! Their value again is truly PRICELESS! So if you are a military spouse let me say a big THANK YOU! Tell another spouse thank you as well! If you aren't a spouse say thank you to one on their special day of recognition! It is the least we can do! And don't forget we now have a lot of male spouses too! A Minute Out of the Norm: "I Spy... Nature"
AH Spring... flowers are in bloom, grass is turning green, there are new things to discover every day in the eyes of a preschooler. This week I am visiting my parents. They are about a five-hour drive from my home so when we go to visit we usually stay awhile! (Not that I can complain about five hours. We were many many more hours away from my own grandparents growing up.) My parents' have a great home for their grandsons to visit: acres of property, hills to rough and tumble on, old 'hunter's stands' for great forts, and a dirt driveway for Tonka-trucks and -bulldozers. What more could could the little guys want?! Well maybe to be home. The whining started yesterday afternoon, I'm bored, I miss my bike, I miss my friends... etc etc. I racked my brain with thoughts of what can we do during down-time when they are wanting a little "Mommy" time. So after dinner we donned our 'hiking boots' and went for a nature walk. We put wild-flowers, grass, clover, even a wild-turkey feather in our bag. Then we headed home. After baths, to get rid of the bug-spray, the boys laid out their treasures and we put a little dab of glue on each piece of 'nature' and stuck it to paper to make a collage. At this point we could have hung-it up to enjoy but instead we decided it would be a great piece of art to send to Dad, who is off in the great-wild world serving our nation. To make this even more fun: The 5 year-old loves "I Spy" books and he had me write out a special page with some of the items, titleing the page "I Spy...". So now hubby will open up his picture and not only enjoy the nature of Michigan but the reminder of how the two of them would sit and enjoy looking through the I Spy books. If you are looking for something to get out with the kids and shake it up a bit go for a 'Nature Hunt'. Perhaps you can send your treasures on to a deployed spouse, a grandparent, an aunt or uncle. Hiking, Spying, Picking and then making something for someone else was definitely the highlight of our evening! Attention all Ft Hood Spouses! Have you heard the good news?! Crooks & Henderson are coming to FORT HOOD! Crooks & Henderson train, encourage military spouses; you can help! Statesboro, GA; April 24, 2008 – Based on the highly-successful seminars presented by spouse ‘celebrities’ Tara Crooks and Star Henderson in 2007 at Fort Stewart, Georgia and Fort Bragg, NC, they have created a 2008 Field Exercise™: Priceless Packages, Military Spouse Workshop Tour. Next stop: Fort Hood, TX, June 17-18. Join sponsors, USAA and ConAgra Foods! Sponsorship at any level is a tremendous value and a unique opportunity to brand your business/organization and showcase information in a friendly and intimate setting. Your organization will be seen by a minimum of 300 military spouses as an organization that desires to personally connect with and serve the needs of all military spouses. Army spouses are a very loyal group and motivated to spread the word about worthy products and services they believe in. The appreciation felt for the generosity of your donation will magnify as knowledge about your dedication to military spouses spreads throughout the community, thus creating a powerful statement for your brand. Additional Benefits:• Unique opportunity to build relationships and show your appreciation to military families • Opportunity to be recognized before a captured military audience• High-profile speakers, very popular among military spouses• Goody bags and other opportunities to provide attendees branded collateral materials• Extremely low-cost and almost no effort on your organization’s part. You can rely on Crooks & Henderson’s experience in executing every detail of each event.• Crooks & Henderson have a proven track record of successful events. Tara Crooks and Starlett "Star" Henderson are co-authors of the syndicated Q&A column Field Problems™. Previous Field Exercises™ were very well received; check out photos and sponsor/attendee feedback at http://www.fieldproblems.com/fieldexercises.shtml. Crooks hosts the online broadcast Army Wife Talk Radio of which USAA is a Patriot Sponsor. Learn more at ArmyWifeTalkRadio.com. MilitaryAvenue.com is a website for the military community and military families and this Sunday is Mother's Day! It is certainly a great opportunity to recognize our military moms and the important role they play in our country's security! Our family was not a unique family in that we frequently relied on mom (and spouse) to play multiple roles in a frequently crazy lifestyle that demanded she be teacher, coach, driver, household goods mover, cleaning person for a government house we were leaving during a PCS, nurse, dad during my frequent and long absences and the job description goes on and on! Her resume is impossible for most to match! From a husband's perspective I could not have asked for a person to be a better mom for our children! Deb provided the best for them and insured they were loved, cared for and she helped prepare them for the adult world they would enter! Quite a chore in this day and age and so many military mom's do it successfully even with the tough challenges of the military lifestyle! One of the best attributes this family's mom had was that she did things with a smile and stayed positive under the worst circumstances! The only time I remember her not being able to smile was after jaw surgery with her jaw wired closed. She had an infant, a 2 year old and a 4 year old and had major surgery and kept on moving ahead! Wow! I would have sat in bed and asked her to bring me breakfast, lunch and dinner (all pureed of course as she ate with a straw for 6 weeks) but she went back to her normal schedule as soon as she got home! We are celebrating Deborah's 34th Mother's Day this Sunday with a family gathering and we have certainly been blessed. Enjoy your Mother's Day and celebrate it with a joy and passion for those who work so hard for our families and our country! It was Monday late-morning and we were waiting for the call from Hubby to say we could come out to the Armory and spend some time with him. My mother-in-law had dropped him off that morning as she, my father-in-law and our 14 year old headed home. The 5 year-old, 3-year old and I had enough PBS for the morning and were about ready to start pulling our hair out. We had walked the halls of this late 1950s hotel. We had strolled outside to the closed-pool that was in much need of maintenance. We had lingered in the lobby with the cool 'frog fountain' that I was rather unimpressed with but it kept the boys busy... for all of three minutes. So we gathered back in our hotel room to play this waiting game a little bit longer when all of a sudden I heard it. This wasn't a train, a semi-truck rolling down the highway, nor a diesel school bus pulling around the corner. No, that engine I heard was the "Roar of Freedom". I threw open the window (well cracked it anyway... it was pretty cold out) and told the boys "I just saw a jet!" They stopped what they were doing and ran to the window. We watched him roll by and they heard his engine moments later. Wow, I was taken back to my childhood. The boys counted '7 or 8' jets. Although I would surmise it was one or two just flying by us several times. The five year old wanted to call Grandpa to let him know what he just saw! "Jets, Grandpa, I just saw a jet!" Then there was Tuesday morning. We had hung out at the armory this time in the morning but they put the area in lock-down after noon and we had to leave. So back to the hotel we went until Hubby got off for dinner around 4pm. The waiting game began again. I cracked the window for a little air in our overly-stuffy room and then I saw it. It is like the "Humpback Whale" of the skies: Mighty, Majestic and just boggles my mind! We watched a C-17 fly by us three or four times. What a stark difference between the "Jet" we saw Monday and the humongous C-17. I still don't understand how that plane can make it two feet off of the ground much more up into the mighty skies of our great country. The boys just stared in awe. Imagine that some people see those planes and think "Noise pollution"?! Not me, not my boys... I see them and think of the sound of “freedom”. Our hotel might have been about as crappy as they come but to the boys we had an 'ocean front' view. It couldn't have gotten much better then that. We made it to the Air Force Museum on Tuesday Morning at Wright Patterson AFB. If you are ever in the area take the time to stop in. Unfortunately, do to Hubby's schedule, we had less then two hours to do the whole place. At some point though I plan on taking my Dad (retired Air Force) and my Boys... we are going to get a real lesson in the Sound of Freedom when that occurs I'm sure! On another note, check out http://deploymentlessons.org/. There are some great "one-liners" from spouses on the homefront. I'm still working on getting through all of them ... but I'm sure I'll have my own one-liners to share soon enough! I have been watching and reading the news about the two recent T-38 crashes in which 4 aircrew have been killed in a week and having flown that plane for several years I can really empathize. Our prayers and thoughts for the families of the crews reflect the same concerns and feelings for our sad losses in Iraq and Afghanistan. The pain is real and we all feel it in some way. I can remember when my father went out to the Sheppard AFB Runway Supervisory Unit at the end of the runway to watch me do some takeoff and landings. I felt a lot of pride and then a short time later a family doing the same thing watched their son's plane crash in front of them. What a loss and what pain! Why do we do these things that put us at risk? Psychologists have a great time trying to figure that out. A very high percentage of military personnel have a deep confidence in their own abilities and do not believe bad things will happen to them. We do our own self assessment and risk management (whether we know it or not) every day. But a deep motivation is the love of a country that provides so well for so many and includes so many basic freedoms! We should be willing to defend those freedoms and provide security for all of us. My service started at the end of Vietnam and went through Afghanistan and saw a few other "actions" in between. What a tremendous change in support of the survivors of military service accidents/combat deaths I have seen. The increases in insurance and death benefits will never replace the person but they take away some of the life challenges that the survivors face. I think one of the biggest positive changes is the support of the American public that recognizes the sacrifices families have made in the service of this great country! We are approaching Memorial Day at the end of May and let's make it more than just the start of the summer and a three day weekend! I can remember marching in Memorial Day parades as a high school band member and now realize how the families of those who served and died for all of us must have felt! Better yet; if you know someone who has suffered an injury or loss, please provide that personal support they need! Thank you in advance! It's Thursday and it has been one of those weeks that I would just like to turn the lights out on and forget. Hubby is gone. We went down to the Wright Patterson AFB area on Sunday morning; myself, hubby, three sons, and mother- and father-in-law. They had a nice "Call to Duty" ceremony on Sunday afternoon followed up with a dinner for family, friends, and soldiers at the armory. Ok, so they pretty much ran out of all food before we got through the buffet. That's what we get for being at the end of the line. McDonald's never tasted so good as it did later that evening. The Army put us (the soldiers and families) up in a hotel that night in Fairborn, about 23 miles from the Armory. I still don't get that. I actually had to drive back and forth a few times each day we were there. It sure would have been nice to be closer to the 'action'. But the room was free. So I shouldn't complain, right?! Mom, Dad and our eldest said good-bye to Hubby on Monday morning. The teenager had track practice, soccer practice, oh and a girlfriend to get back to. But it was sure nice to have them with us for the time that we did. It was nice to spend time with Hubby over the course of Monday and Tuesday. We spent most of the day at the armory while the soldiers worked. But even to sit at a table and see him across the room. I treasure those mental-pictures of him! Monday night the local VFW gave us a nice dinner at the armory. (There was plenty of food that evening!) I met some ladies that live a little bit closer to me. (45 minutes as opposed to 3 hours). We are going to attempt to start our own little local-FRG. Perhaps we will be able to link up to the main FRG meetings via tele-communications so that we can avoid the 6 hour round trip drive for the 45 minute monthly-meeting. But Wednesday morning was inevitable. Hubby & I said our good-byes on Wednesday morning at the Armory. The two youngest boys were still in their pajamas strapped in their car seats and pretty much oblivious to the fact that Dad was saying good-bye. I, on the other hand, was painfully aware of the fact I was kissing my loved one for the last time for "a few months". Oh how I love him. So we were on the road by 7am, headed home to our "new normal". At about 7:20am my car was knocked for a loop. Damn deer. So there I was on the side of the road. Sobbing. Wanting to be strong for the kids in the back-seat, yet crashing emotionally under what had just occurred. Everything in me wanted to call Hubby and tell him to come fix this "problem" but everything in me recognized that I too was a soldier in my own right at that moment. I needed to take care of this, and calling him would leave him feeling helpless. I didn't want to do that. He was off to fight a war for our nation, I didn't want him to feel like he had deserted us on the side of the road outside of Dayton. One hour of waiting and then two and a half hours of driving later we stopped at Hubby's parents' house as they had his car (acres of land to store his car while he is gone as opposed to our two-car garage FILLED to the brim with children's bikes, toys, garden paraphernalia etc etc). Mom asked me how I was doing and I just looked at her blankly and said "OK". She followed it up with a "No, you aren't." We hugged. We sobbed. I had never cried in her arms before and it felt so good to have that human touch. As I pulled in to my own driveway 45 mintues later my neighbor greeted us with a "How ARE you, Leanne?" I told her of our travelling trials and she said that this just proves that God knows I'm as tough as nails. Wow, I had never thought of myself that way. Hopefully, He won't need to continue proving that over the course of this next year. Tomorrow I have a much better story to share though! I'll never forget the first time my own child saw a real life jet soar through the sky. THAT was what this is all about. THAT is what I will hold on to whenever I wonder if this is all really worth it. Stay tuned! May Day in our household was not a radio cry for help, or a Russian march on Red Square. We didn't set up the May poles, or sing the song from Broadway's "King Arthur" -The Lusty Month of May. However, we did haul out the colored paper, scissors and tape. It is May first: May Day. It is time to acknowledge that without a doubt Spring has been here for just a bit, flowers are here, and summer vacation is almost here. It is time to be a bit restless, time to stay out of doors a bit longer and time to have a bit of chocolate captured in a homemade May Basket! Oh yes! I remember our first May Day basket building time... a 2nd grader, kindergartener and preschooler each worked on their master piece, then I filled each with chocolate covered caramels. But... they couldn't have them just yet. Outside we went. They lined up with their backs toward me, as I placed one of the baskets behind one of them. Ah, it's May! The object of this holiday was to catch and tag the person who placed the basket behind you, then give them a kiss! The reward - the basket of candy. When I put the basket down behind one of them, I tapped on their shoulder. The chase was on. Upon tagging me and giving me that kiss, the chaser could have the sweets. Then, the chaser became the basket placer - and they had to run until they got tagged and kissed, and on until the last child had a turn. I got the squeals of laughter, the kiss and the memories! We did this from Texas to Iceland (high school graduation). Each child invited friends to join in on the goofiness of it all. Fun! We made our baskets from woven colored paper 3/4 inch strips. The easiest way was to make it into a placemat, roll it into a cone shape and load on the tape. They were the kid's creations and only needed to last a short time. Every May Day I still smell the chocolate, I look back at pictures and see the smiles, I talk to the kids and hear their thanks for times spent together. Making memories and tagging them to days on the calendar help create cohesiveness that Military Brats need. The family is their support structure. What are some unique celebrations that your family holds dear? Do you remember some from your childhood that you need to pass on to your children? Share them with us! We just might want to start these in our family too! Thanks in advance!